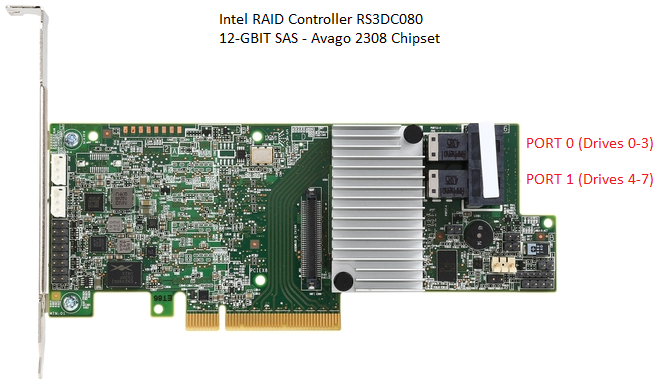 The new 12-Gbit SAS Hardware RAID Controllers use the new LSI / AVAGO 12Gbit SAS Controller Chipset, the 2308. Cards based on this chipset feature an updated RAID BIOS that reverts to a more text-based layout. The main functionality of the previous RAID Web BIOS is still available, but accessing it is different. Hint: Cards and modules which use the new chipset require you to press CTRL + R during the system POST process, instead of CTRL + G.
When Do You Need to Import a Foreign Configuration? A "foreign configuration" situation occurs when the configuration on the RAID controller doesn't match the configuration on the drives. This often happens if the RAID controller has just been replaced, or if the physical drives have been moved from one server to another. Many controllers with up to date firmware may automatically import foreign drives if there wasn't a configuration previously on the card. If this automatic import doesn't happen, or if your controller has been previously used, you will need to follow the instructions below. Before you start: If you have just replaced the RAID controller, always upgrade the RAID firmware before connecting the drives and attempting to import the RAID configuration. To upgrade the firmware, you will need the firmware files from the Intel web site and a FAT32 formatted USB pen drive. Upgrade the firmware using the EFI Shell. Don't connect any drives until you have upgraded the RAID firmware. Download the latest controller firmware from the Intel web site. Extract the firmware to a folder inside a FAT32 formatted USB pen drive. Run the Firmware update NSH file to start the upgrade process. With the system off, connect your drives to the controller. Ensure all drives are connected, and that you plug the drive cables into the correct ports. Example below. Boot the system into the RAID BIOS by Pressing CTRL + A when prompted. If you get a message with regards to a foreign configuration being detected, you may press F to try and import the foreign configuration however it is usually best to go into the RAID BIOS and check that this has been done successfully. If the controller has no valid configuration, you will be greeted with a RAID screen that shows no configuration is present, although there is a reminder on the right hand side that there is Foreign Config information available. To get to the Foreign View menu, press CTRL + N four times to move through the tabs at the top. Notice in the example above that there is one Virtual Drive (VD) in the foreign configuration. Check that all of your configurations or virtual drives are present. If not, use the PD Mgmt tab to check that all of your physical drives are present as expected. If drives are missing, switch the system off, and re-check all cables and drive seating. To import the foreign configuration, use the up arrow to select the RAID controller. Now press F2 to perform Operations on the Controller. You will get a pop-up menu for Foreign Config. Press Enter to open the Foreign Config menu to be given the choices of Import or Clear. Make sure Import is highlighted, and press Enter. You will then be prompted if you are sure you want to do this. The system should now go back to the VD Mgmt menu. Note that your expected VDs are online. You can now safely exit the RAID BIOS by pressing ESC, and then reboot by using CTRL + ALT + DEL. During normal boot, after drive detection, the system should confirm that 1 Virtual Drive (VD) is installed and operational. Intel 12G Hardware RAID Controllers or modules, including RMT3PB080 (ISRRAI-160), RS3DC080 (ISRRAI-167), RMS3CC040 (ISRRAI-171), RMS3CC080 (ISRRAI-172), RS3DC040 (ISRRAI-174) and RS3DC080 (ISRRAI-175).